A printed copy of the Department's log is available daily at our station at 18 Waterworks Road, Durham, NH during normal business hours. 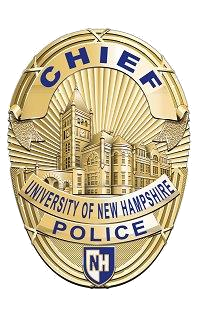 The University of New Hampshire is required by the Jeanne Clery Disclosure of Campus Security Policy and Campus Crime Statistics Act to publish an annual report on our crime statistics and our security policies. Each year by October 1st we publish the UNH Clery Report on our website. A paper copy can be obtained if desired.